Mezha Parker began working as a certified nurse assistant in hospice care in 2001 before she eventually began her specialty career in oncology with Cancer Care Associates. Prior to graduate studies, Parker worked in the treatment room as an infusion nurse for Oklahoma Cancer Specialists and Research Institute. 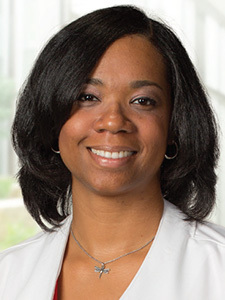 As a nurse practitioner, Perker’s roles include cancer prevention and screening; working collaboratively with the oncologists to deliver care to patients undergoing active treatment; caring for patients who have completed treatment and are being monitored for disease recurrence and long term effects of treatment; and caring for patients in the terminal phase of illness, especially symptom management.